This is my first post here, and I am looking for help, because everything I try simply does not work. When I search on google, google analytic redirects me to random sites, I can not seem to fix this problem. It keeps getting worse, and my system and internet browser are so slow, that I simply cannot deal with it anymore. Also, my email account was recently hacked - not sure if this is related. I know that you require logs from Malwarebytes, Superanti, and Hijack, but this virus does not let me finish the installation of these programs, and or does not let me update them, and or run a scan with them. I did not receive the disks when I purchased the laptop. My computer will not allow me to access the aswMBR software. Thanks for your time, and help. It is appreciated! In the upper right hand corner of the topic you will see a button called Watch Topic.I suggest you click it and select Immediate E-Mail notification and click on Proceed. This way you will be advised when we respond to your topic and facilitate the cleaning of your machine. Finally, please reply using the ADD REPLY button in the lower right hand corner of your screen. Do not start a new topic. The logs that you post should be pasted directly into the reply, unless they do not fit into the post. System is not running any better. Lets try a few other things. Are you able to burn CD's and have access to a USB Flash Drive? Please download MBRCheck to your desktop. 1. 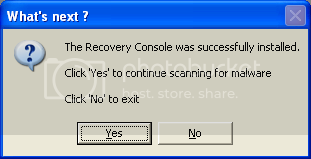 Double click MBRCheck.exe to run it (Right click and run as Administrator for Vista). 2. It will open a black window, please do not fix anything (if it gives you an option). 3. Exit that window and it will produce a log (MBRCheck_date_time). 4. Please post that log when you reply. Click here to download Kaspersky Virus Removal Tool. Click on the option that says Threat Detection and change it to Disinfect => Do not select, delete if disinfection fails. Before it is done it may prompt for action regardless of the setting so choose skip if prompted. Are you connected to the internet through a Router? IF so we need to reset that Router.